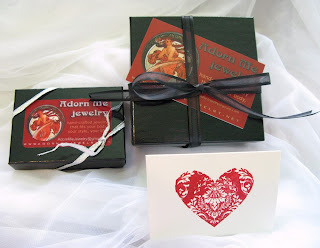 At Adorn Me Jewelry we like to wrap our jewelry elegantly. Our hope is that when our customers open their mailing package it looks like a gift, whether it is actually a gift for someone else, or for them. More practically, the boxes protect the items. I have had three customers now tell me that their purchases arrived in ripped bags with crushed boxes, but the jewelry was protected because of the boxes. I'm guessing there isn't a lot of that sort of thing, but I know that there are some who work for the PO who are actually abusive to packages and who unfortunately save special kicks for ones marked "handle with care" or "fragile," which is why I avoid ever writing that. One service we happily offer is to fill out the enclosure card if it's a gift. We ask the client what they would like it to say and fill that out. In wrapping we'll often not tie the bow so that unless it's being mailed directly to the giftee, they can peek in to see what they have purchased and then tie the ribbon themselves before giving to the person. If it's for themselves, it feels like a gift even though they have paid for it. In that case, the enclosure card is a thank you card. 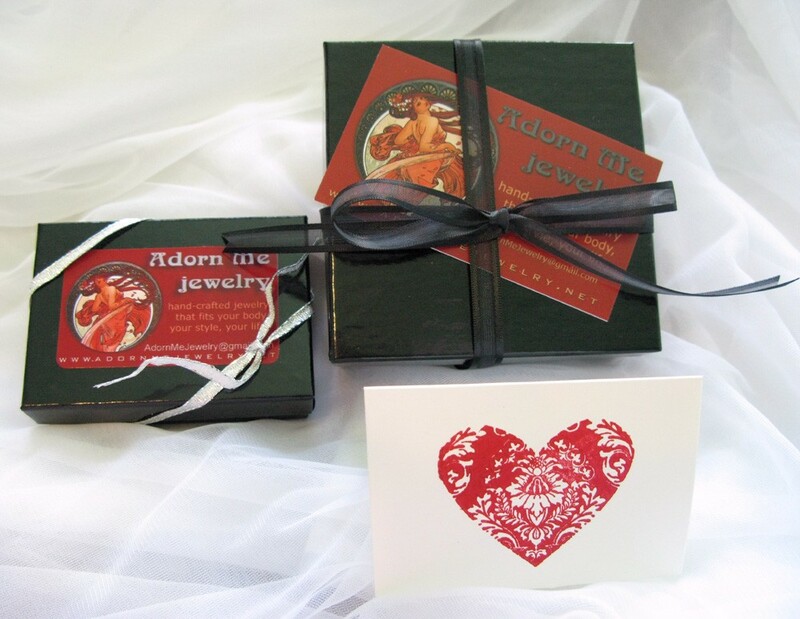 The cards are hand stamped with a burgundy red damask heart-shaped pattern. Our boxes come in two main sizes: small, for earrings and rings, and large, for necklaces, bracelets and multiple purchases. 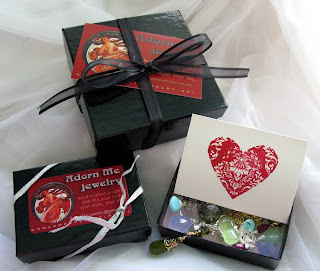 The small boxes have our logo labels on them and are wrapped with a silver bow tied in a knot. The large boxes have no label and we use organza ribbon trimmed with satin to tie it in a bow and then slip our business card in there. The gift enclosure/thank you cards fit in each box. Wrapping our customers' purchases carefully and lovingly is a pleasure, and is part of what we do to let them know how special they are and how much we appreciate their business. Thank you for the invitation, Heather. It was a pleasure to contribute! What beautiful wrapping! It's good to stop and think about these things isn't it.